Hey guys, this is my build guide for the Purifying Flames Chieftain. Very powerful, very smooth, very tanky. Great all around character that scales well with gear, but can be played cheaply at a baseline level. I like to make builds that are well-rounded and can clear and participate in all of the content PoE has to offer - maps, bosses, delve, etc... I've played since Warbands and played many different characters over the years, and I can very confidently state this is my strongest character by far that can safely faceroll and blow up most of the content in the game with relative ease. Farms uber elder easily while simultaneously being a powerful mapper with massive, tectonic-level AoE. I'm generally a melee player but figured I had to try some spell slinging in the spell-focused league. I chose purifying flames because the visual effect looked great, the base damage was extremely high, and I saw a ripe opportunity to abuse conversion and phys to fire double dipping akin to other phys to ele skills like glacial cascade. A glacial cascade with nearly 3x the damage range (so don't have to worry about overlaps), tectonic super slam levels of AoE, and free consecrated ground??? Sign me up. This build has two key features: Herald of Ash scaling and GIANT AoE. Most of our damage comes from these two bad boys, the new Circle of Anguish. The second I saw these rings I knew I wanted to abuse their interaction with Herald of Ash. So Herald of Ash gives you extra physical damage as fire AND more fire spell damage. Most skills in the game benefit from one or the other in a major way, Purifying Flames gets a massive boost from both components because it is physical AND a fire spell. Therefore, the "75-100% increased effect of herald of ash" mod gives us around ~15% MORE damage, and the rings STACK!!! Absolutely nutty. The increased fire damage is just an added bonus, but you can opt for a cheaper ring with a different secondary mod, the most important is the EFFECT mod. 30-40% MORE damage from our ring slots alone. If you don't have the currency to afford a ring with both the "% increased buff effect" of herald of ash and "increased fire damage", just prioritize the "increased buff effect." That's the most important, the secondary mod can be max fire res, fire res, or reservation which I think are cheaper. I repeat, you do not need an exact copy of my rings. Circle of Anguish can roll a potential pool of 5 mods, just look for one with the BUFF EFFECT mod and any other secondary mod, MUCH CHEAPER. Intensify + Inc. AoE allow us to cover the entire screen and beyond with giant explosions and consecrated ground. The AoE is comparable to a tectonic charged slam for fellow melee players out there. Get the helm enchant for even more AoE, over 150% increased between the gems, the tree, and the enchant. Bu bu bu WHY CHIEFTAIN and not OP Trickster/Inquisitor?????? Well as explained in the secret sauce above, we are abusing the new herald of ash rings with a phys to fire conversion build and so chieftain is a natural fit. Chieftain gives us 50% free conversion (so 100% fire conversion because of the innate conversion on Purifying Flames) without the downside of Avatar or Fire (or long pathing) as well as loads of fire damage multipliers, fire pen, and free leech. Also, considerably tanky and like I said -- I'm a melee player, so I want to dish out that monstrous damage spells are known for, but also face tank! Hits all our core needs. Choose the CHAD Chieftain over the frail Inquisitor or virgin Trickster. Don't be another occultist drone on the assembly line of occultists on everyone's friends list :). +Giga boss killer - Farmed uber elder repeatedly with ease the second I had access to it, never bricked a set as a relative amateur boss killer. +Gigantic AoE - Tectonic Slam and pre-AoE nerf levels of screen cover. Everything on your immediate screen and dies, sometimes with some off-screening. HUGE AoE :). +Easy to play - Like I said, I'm a melee player, so I wanted to build a spellcaster that could stand, shoot, and tank. -Cannot do ele reflect maps. -Struggles with no life/mana regen maps - Can be done with a mana flask swap in or mana gained per hit/kill somewhere. -Not a super speed build - Your mobility is tied to flame dash and a quicksilver. Not slow, but not the Flash! -Circle of Anguish can be expensive - You can play on a budget with a Mark of the Shaper + Elder ring setup until you have some currency. **BUDGET NOTE** Most of my gear here is pretty high end luxury and expensive as I spent a lot of time upgrading and farming. You don't need all this to do mondo damage while being tanky; there are always budget options, i.e. increased buff effect rings, but with a different secondary mod (fire res, max res, or reduced reservation). You don't need a double zealotry watcher's eye, just 1 mod zealotry or 1 mod zealotry + clarity is great. Staff doesn't need to be perfect, my old one lacked +2 to fire gems and was just fine. Quick Notes: Most important pieces here are the rings with "% increased herald of ash buff effect" and the staff. You can get a budget staff for cheap (I used a 1ex staff that had only ~17% less damage than my current for a looong time). You definitely do want to invest in crafting your own staff if you have the currency, looking for mods like Arcane Surge, Double Damage, and + to level of socketed fire gems (get at least 2/3 before multimodding!). As noted earlier, prioritize the "%increased buff effect" of herald of ash mod if you don't have the currency for a circle of anguish with both buff effect and raw fire damage. I repeat, you do not need an exact copy of my rings. Circle of Anguish can roll a potential pool of 5 mods, just look for one with the BUFF EFFECT mod and any other secondary mod, MUCH CHEAPER. Belt: Look for high life (both + to max life and %inc max life) and life recovery, the latter scales our monster regen and increases our life leech. Gloves: High life, rezzes, could opt for faster casting gloves, mana mods are ok.
Staff: Arcane Surge, +level of socketed fire gems, double damage, cast speed, %of phys gained as extra fire, adds fire damage, adds fire damage to spells, and crit multi are all good staff mods to look for. You definitely want at least 1 of the first 3 listed mods, 2 if possible. But if you're on a budget look for some of the latter mods. Spell damage isn't important because we can craft it with chaos damage or it comes with the arcane surge mod. Crafting %of fire damage taken as chaos damage is nice as well. Switchables: Conc. Effect and Controlled Destruction (CD optional for high mobility bosses where intensify isn't much use, personally I rarely swapped this in as I just face tanked most bosses). -Lots of extra damage from our cwdt with free minus fire res, flammability, and exposure applied by the wave of conviction. Can opt to drop Combustion or Flammability for Immortal Call if you want some extra survivability. When I played, I didn't have many death scares on maps nor bosses, but as with all life builds -- there's a very careful needle that tips you one way or the other. It's easy to go from popping frequently to having just enough time to react, survive, and stay topped off. 1) Make sure you have a life recovery belt, ideally 15-20% roll. This is very important for our later bossing survivability as it allows our total leech and regen to outpace incoming damage output so we get full healed in between any threatening hits. You can craft one fairly easily with pristine fossils on an elder belt base. 2) If you're still having issues, drop either combustion or flammability in our cast when damage taken setup, and instead, include immortal call. This gives you a little bit more time to heal up and react to large physical hits on bosses like Minotaur. 3) Make sure your Pantheon powers are fully upgraded and use Lunaris + Tukohama. Projectiles are always my biggest annoyance in POE, they are by far the most lethal source of damage in general content. Lunaris helps mitigate projectile damage and give us more time to react. Tukohama amps our already high life regen and gives great bonuses when we stand and face tank, which is our goal. 4) If you're used to playing ES builds, it might be difficult adjusting to using a life flask. Make sure you're finger is ready to hit that every now and then to help you recover from unexpected hits during maps or bosses -- to me, I play life builds a lot so it's second nature, but I know ES players don't enjoy using a life flask. Make sure it's well rolled and qualitied. 5) Flame dash is your friend and a very key part of our survival. Most things in the game we can face tank but POE is all about random one shots (I'm looking at you betrayal). When in danger zones, i.e. betrayal ambushes or very dangerously rolled high level maps -- keep your flame dash key hot. Flame dash gets us out of bad/dangerous positions quickly and gives us time to quickly regen back up and safely kill from afar. 6) Make sure you are always on consecrated ground. Between Zealotry and the Purifying Flame shockwave we are generally always on consecrated ground as the screen is covered with it. Sometimes however; we'll just be on the edge of it and it doesn't hurt to fire off a purifying flame right on top of us to create consecrated ground and quickly regen during bosses or in between phases. This is especially important when we have conc effect in. Hope these tips help anyone having issues surviving!! **NOTE** I took frostwalker to cap out my cold res., if you're fine on resistances, you can drop that point. 1) Can just use purifying flames from act 1 on, very powerful leveling skill because of the free consecrated ground. Like a better old school Sunder. 2) Path to big life nodes first. Damage isn't an issue if you have a tabula so just pick up some phat life to survive running through areas. Get to ele overload fairly quickly and use an increased crit gem if you need to in order to proc it reliably. 3)MOST IMPORTANTLY, the ascendany points. Take Ngamahu, Flame's Advane first, then Tawhoa, Forest's Strength for cruel lab, and Ramako, Sun's Light for merc lab. Save Hinekora, Death's Fury for uber lab. The big 3 staff mods that we look for are Double Damage, +2 to level of socketed fire gems, and socketed gems are supported by arcane surge. Getting all 3 of these on one staff is an insanely rare pipe dream, so we want to aim for two of the three. You can buy an already completed staff with two of these 3 and some other decent rolls, or you can buy a shaped staff with 2/3 rolls and empty mods in the other slots and multicraft something like my staff. The base of our staff doesn't matter since we're ele overload, any base will do. If you're on a budget and don't have money to buy a giga staff or multimod/craft your own staff, just look for 1 out of the 3 key mods instead of 2 when shopping for rares. Other mods to look for on staves include %of physical damage gained as extra fire, %of elemental damage gained as chaos, or %of fire damage gained as chaos. Cast speed is great, as is a t1 fire damage to spells or raw fire damage roll. Another budget route that might honestly be the ideal is to use fossil crafting. Hit a solid base with scorched + aetheric fossils until you get something decent. Fossil crafting introduces a new big mod that we like, "Socketed spells deal 20% more damage." This is essentially equivalent to 20% chance to deal double damage. Faceroll everything! I said at the top I wanted a spellcaster that could just facetank and blow up the screen, and that's what we ended up with. 7.5k+ HP, endurance charges and phys to fire damage taken as chieftain, and 5mil+ DPS pretty much allow us to safely tank most things straight to the face. We kill most map bosses in under 2 seconds, and you'll even notice the hits are so large that bosses will be straight up stunned most of the time. The only fight that will require more movement and awareness is uber elder. You still must dodge various Shaper/Elder abilities with flame dash, but we do so much damage that you're out of this fight in a couple minutes and phase them very quickly. Nearly every other fight in the game can be straight face tanked -- Map Bosses, Elder Guardians, most Delve Bosses, Shaper Guardians, and even Cortex! This is pretty much personal preference. I like using Lunaris and Tukohama as I hate projectile enemies and Tukohama gives us more life regen and phys reduction when we stand and cast. Switch to Yugol for uber elder (and use a sapphire flask). 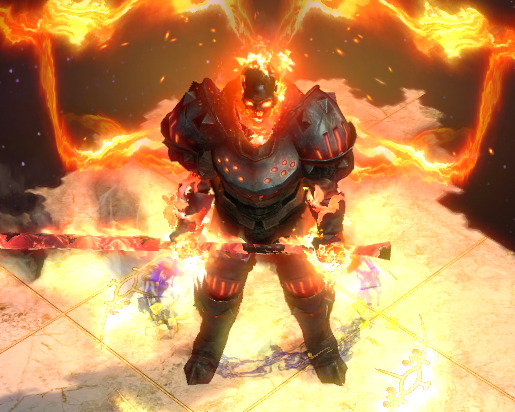 I chose to do an ele overload build because it's much easier to gear, fits chieftain a bit better, and allows us to invest in more life and utility nodes in the tree. HOWEVER, you can easily convert this into a crit build by dropping ele overload, taking power charge, crit multi, and crit chance nodes on the tree and using a different type of staff. I opt for free Arcane Surge on my staff, if you want to do crit you should aim for a Power Charge on Crit Eclipse staff. *Feel free to give me any formatting tips or ask any questions, this is my first proper build guide. On the pob, you have scorching ray enabled, even though it isn't able to be linked anywhere. You should make a note that you could either use scorching ray and a non-kaoms chest, or remove it from the kaoms setup. Dps is still listed at 5.1mil, but the 5.8mil with scorching ray isn't possible with kaoms. More importantly, Scorching Ray's stages under PoB incorrectly apply the old Scorching Ray bonus. Now Scorching Ray simply applies the same bonus Wave of Conviction does so the skill should be removed from the build entirely regardless. Do you have any videos of gameplay, I'm interested to see how the aoe works in general mapping, as that's been holding me back from really enjoying purifying fire to-date. Thanks a lot for sharing this man. I'll try to put up a video or gif at some point; I've been enjoying my newest character so I've been lazy on going back and making videos. edit: Added a few gifs and a video in the OP. Added a gif at the top of a minotaur kill, a gif showcasing the AoE near the bottom, and a full video of the minotaur map/kill towards the bottom as well. Forgive the very poor quality of the video and the background talking; like the title says it was quick and dirty. ALSO, the map had a 25% less AoE mod and temp chains, so not the best map run for showcasing the AoE of the skill. But it's a sample/taste. Hi, looks great! will try. Can you make a crafting section for things like the staff?